Preheat oven to 450° F. In medium pan over medium heat, grill al fresco® Sundried Tomato Chicken Sausage, remove from pan, and slice into 1/4" pieces. In the same pan, sauté garlic, artichokes, red peppers, balsamic vinegar, and olive oil. Remove warmed veggies from heat. 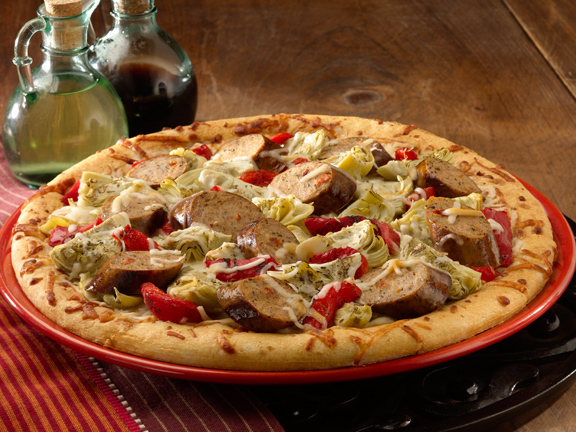 Arrange veggies and chicken sausage evenly over the Boboli® pizza crust leaving a 1" border. Sprinkle with mozzarella and Parmesan cheese and oregano. Salt and pepper to taste. Bake 8 – 10 minutes or until crust is golden and cheese is melted. Remove from oven, let cool, and enjoy!